To maintain a beautiful healthy smile at all times, regular dental check-ups, professional cleans and ongoing dental hygiene education must be maintained. 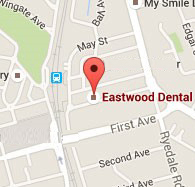 At Eastwood Dental we strongly promote preventative dentistry to ensure our patients get into good oral habits as early as possible. We encourage the maintenance of these habits, which ultimately prevents more threatening oral problems in the future. We encourage you and your family to attend twice-yearly dental check-ups and clean along with maintaining good oral habits. Customised Oral Hygiene instruction to fit your needs. Why should I visit the dentist for Check-up and Clean? Looking after your teeth is about more than just vanity. Having a good oral hygiene routine and maintaining these check-up appointments means you can prevent the build-up of bacteria known as plaque. This can cause countless dental and health problems, as well as pain and discomfort. Any build up of plaque needs to be dealt with quickly. At each visit your plaque level will be assessed and an appropriate oral hygiene instruction will be provided. By maintaining these check-up appointments you will not only be protecting your teeth from decay by the build-up of plaque, you will also be protecting your mouth from gum diseases, which is the most common form of tooth loss. Keeping your teeth and gums clean from plaque and it's build up will also prevent any future complications for patients with heart problems or diabetes.